A popular Netflix time travel drama about set in the far away future where humans need to travel back to 21st century in order to save humanity's destruction. Travelers is a show that has stayed a little under the radar, but it definitely worth the watch! Where can you stream Travelers? 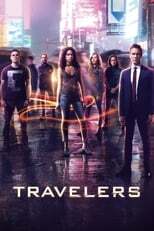 On 2016-10-17 Drama/Sci-Fi & Fantasy TV Series Travelers first aired on Showcase. Written and created by Brad Wright, and produced by Peacock Alley Entertainment, .